Artisan made, starting with creating freeform shapes, then texturing, bending, forging and forming for a feminine touch distinctive to each pair, just like you. You can select your own color of beads too just to fit your wardrobe colors. The warm tone of nugold metal is specially formulated for jewelry to complement every skin tone. Torching brings out the lovely copper tones. 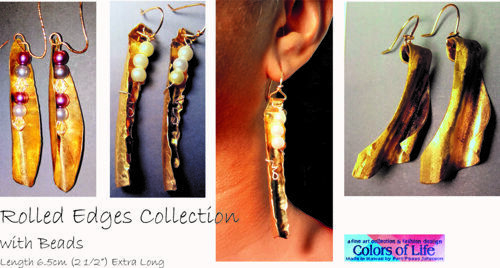 The earrings are highlighted with selectively chosen beads. Nugold: A modern metal of brass alloy 85% copper/15% zinc resembling gold. Copper also used. Each piece is individually coated with micro-crystalline Renaissance Wax. 1) Place the order by selecting add to cart button. In the comment box, state your choice: Example: top row, 2nd from left. I will email you a photo of your earrings before sending for approval as I will create a pair similar to your choice for already sold items. You could select your color of beads this way! Allow 10-20 days delivery from date of placing order. 2) Full guarantee if not satisfied. See purchase info page for details. It’s all about surface texture and shape with the contrast of simple elegant beads. The warm tone of nugold metal is specially formulated for jewelry to complement every skin tone. Torching brings out the lovely copper tones. 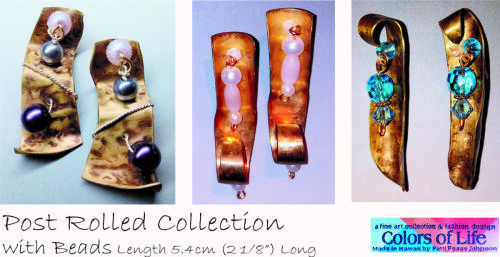 The earrings are highlighted with selectively chosen beads. You can select your own color of beads too if you want! A silver twist adorns these uniquely textured metal earrings with beads. Adorned with non-tarnish silver plated twisted wire. Nugold: A modern metal of brass alloy 85% copper/15% zinc resembling gold. Copper also used. Each piece is individually coated with micro-crystalline Renaissance Wax. 1) Place the order by selecting add to cart button. In the comment box, state your choice: Example: top row, 2nd from left. I will email you a photo of your earrings before sending for approval as I will create a pair similar to your choice for already sold items. You could select your own color of beads this way! Allow 10-20 days delivery from date of placing order. Can be adorned with non-tarnish silver plated twisted wire. The warm tone of nugold metal is specially formulated for jewelry to complement every skin tone. Torching brings out the lovely copper tones. 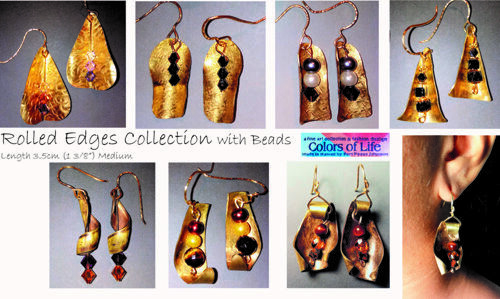 The earrings are highlighted with selectively chosen beads. The appearance of simple and straightforward metal to match any casual or dressy attire you desire. It’s about choosing the correct hammer, and appropriate stake in order to create the texture and form in these hand-crafted earrings. The warm tone of nugold metal is specially formulated for jewelry to complement every skin tone. Torching brings out the lovely copper tones. 1) Place the order by selecting add to cart button. In the comment box, state your choice: Example: top row, 2nd from left. I will email you a photo of your earrings before sending for approval as I will create a pair similar to your choice for already sold items. Allow 10-20 days delivery from date of placing order. 1) Place the order by selecting add to cart button. In the comment box, state your choice: Example: top row, 3rd from left. I will email you a photo of your earrings before sending for approval as I will create a pair similar to your choice for already sold items. Allow 10-20 days delivery from date of placing order. Asymmetry is part of the beauty of hand crafting. Hand-painted silk professionally steam set using dyes for lasting color. The jewelry parts are made of brass and gold plated twice, then protected with resistant varnish. Silk covers copper insert. Length: 3.5cm (1 3/8”). 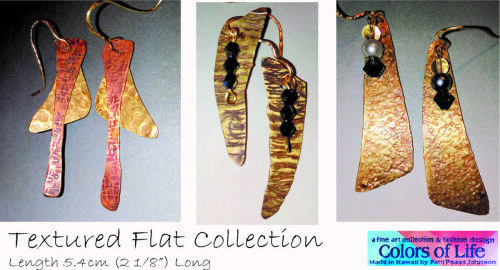 Ear wires: stainless steel or brass. 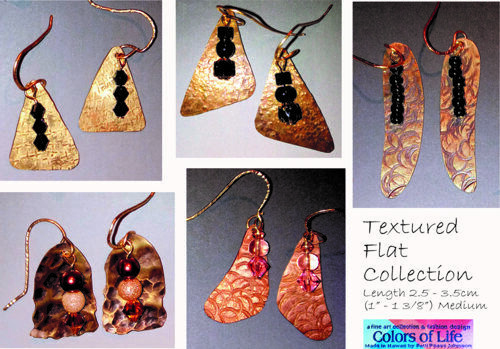 If you want your earrings similar to ones in the photo, in the comment box state an example: "Like the top row, 3rd from left." 2) Place the order by selecting add to cart button. In the comment box, state your colorway choices. I will email you a photo of your hand-painted silk earrings before sending for approval. Allow 10-20 days delivery from date of placing order. 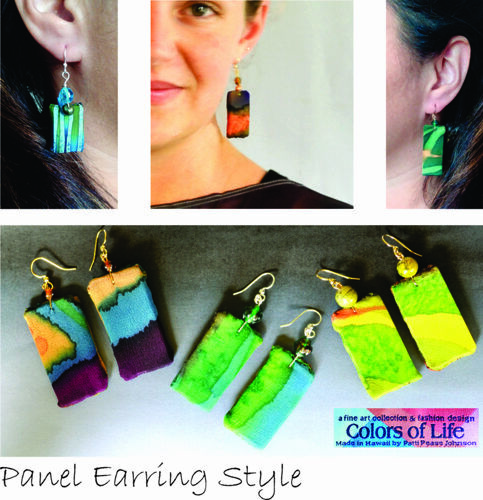 Fun, lyrical earrings of hand-painted silk with liquid dyes professionally steamed to set the colors for lasting beauty. Made of silk covering foam core panels, very light and airy, with carefully chosen accompanying beads. Length: Short 3.7cm (1 1/2”); Long 5cm (2”). Ear wires: stainless steel or brass. 2) Place the order by selecting add to cart button. In the comment box, state your colorway choices and length. I will email you a photo of your hand-painted silk earrings before sending for approval. Allow 10-20 days delivery from date of placing order. 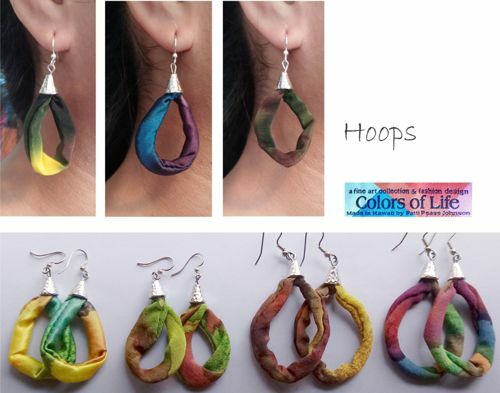 Fun, lyrical earrings of hand-painted silk with liquid dyes professionally steamed to set the colors for lasting beauty. 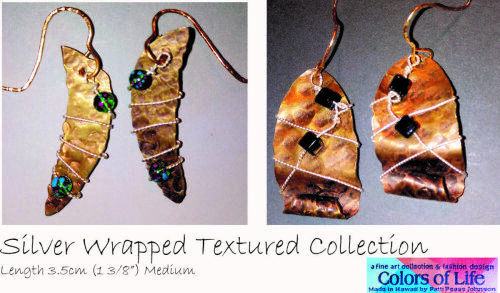 Made of silk wrapped wire with carefully chosen accompanying beads. Length: 5.6cm (2 1/8”). 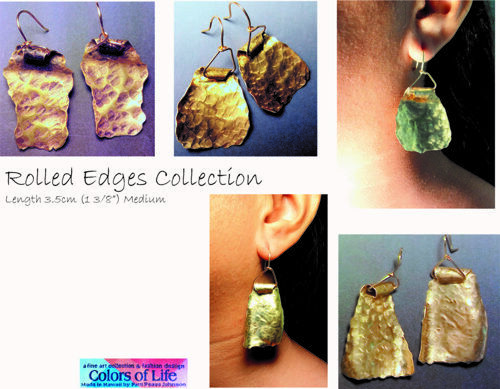 Ear wires: stainless steel or brass. 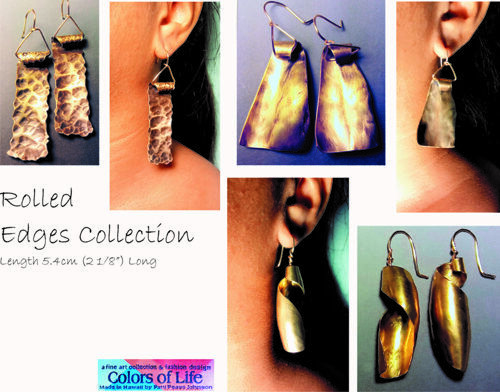 Fun, lyrical earrings of hand-painted silk with liquid dyes professionally steamed to set the colors for lasting beauty. Made of silk wrapped wire with hammer textured caps. 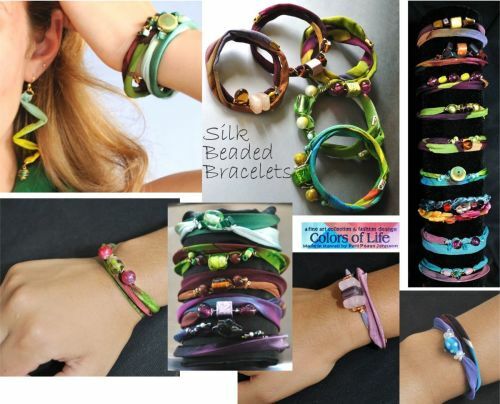 Bracelet of hand-painted silk with liquid dyes professionally steamed to set the colors for lasting beauty. Selectively chosen beads to accent the color tones. Made of silk wrapped memory wire. If you want your bracelet similar to ones in the photo, in the comment box state an example: "Like the top row, 3rd from left." 2) Place the order by selecting add to cart button. In the comment box, state your colorway choice. I will email you a photo of your hand-painted silk beaded bracelet before sending for approval. Allow 10-20 days delivery from date of placing order. It’s a color band bracelet of hand-painted silk with liquid dyes professionally steamed to set the colors for lasting beauty. Made of silk wrapped memory wire.